Almost 400 people have been evacuated from their homes in the Paris region as a precaution as rivers across France keep swelling. Thirteen departments across the country remained on alert for floods as heavy rainfall continued to batter many regions yesterday. In addition to Paris, where the Seine river was expected to keep rising until tomorrow, the other regions threatened are in the north and east of the country. Seven other departments in central France have been placed on alert for snow and ice. 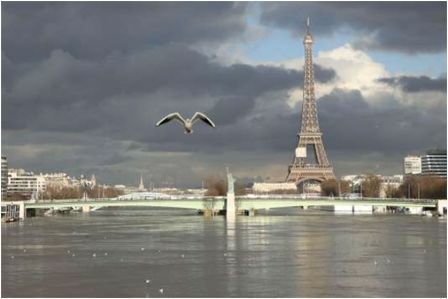 Meteo France said that exceptionally high levels of rain this winter were to blame for the floods, with rainfall in Paris twice as high as normal. Le pic de crue de la Seine, attendu ce week-end à Paris, devrait être moins élevé qu’attendu. A la station du pont d’Austerlitz, à la mi-journée, la Seine était à 5,70 m, contre 5,62 m vendredi vers 17 heures. Sept gares parisiennes du RER C, en bordure du fleuve, restaient fermées samedi. In an ongoing, if often futile, effort to thwart the insidious creep of foreign words, the Enrichment Commission for the French Language is turning its nose up at the word 'smartphone'. Instead, it would prefer the French to use le mobile multifonction, or 'multifunction cellphone'. According to the Oxford Dictionary blog, the commission previously attempted to replace 'smartphone' with l'ordiphone (from ordinateur 'computer') and terminal de poche (literally, 'pocket device'). Police in France have been called to supermarkets in some cities after shoppers became violent as they battled for cheap Nutella. The Intermarche chain of supermarkets offered a 70% discount on the chocolate-hazelnut spread that is a favourite in France, bring the price down from 4.50 euros ($7.60) to 1.40 euros. "They are like animals," one customer told French Media. Une promotion qui vire à la cohue. Des clients qui se ruent sur de la pâte à tartiner à prix cassé. Depuis hier, jeudi 25 janvier, de nombreuses vidéos amateurs qui témoignent de ce phénomène circulent en boucle sur les réseaux sociaux. La cause ? 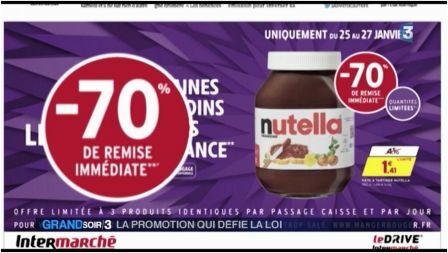 Une remise lancée par l'enseigne Intermarché : -70% sur le Nutella.